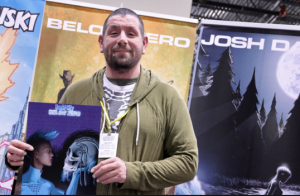 Josh Dahl is the creator of Rapid City Below Zero Comic. He drops in, in the middle of a business meeting, to talk about his KickStarter for Issue #5 of Rapid City Below Zero, which wraps up the story arc for his Book #1. He also talks about his giveaway of Episodes 1 thru 4, so get them while the getting’ is good. We also talked about his other website Making Better Comics and what you can find there. Josh will be appearing at Seacoast Comic Con and Boston Comic Con in the coming weeks.